Police, soldiers and relevant park authorities are returning to the so-called Tiger Temple in Kanchanaburi province today (April 2) as missing tigers remains a mystery. They will be returning with a court order after yesterday̕s (April 1) inspection of the temple failed to get any progress after the temple refused to cooperate with the combined team. 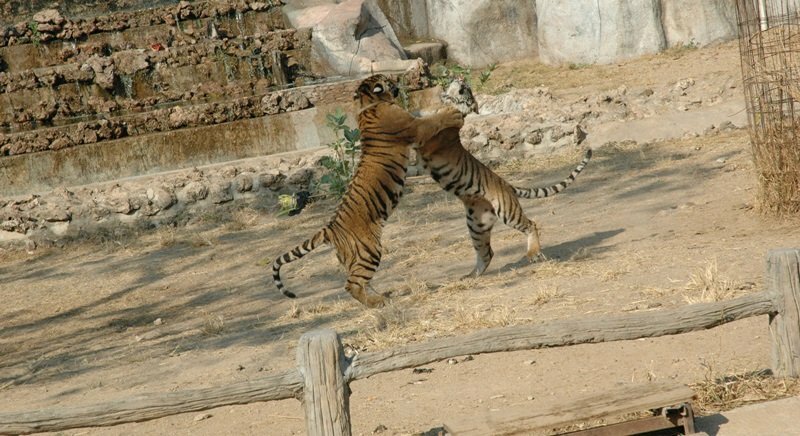 The team was conducting an investigation into the alleged disappearance of three tigers from the temple following fresh complaints. Adisorn Nutdumrong, director-general of National Parks, Wildlife and Plant Conservation, led police, soldiers, veterinarians and officials from the Natural Resources and Environment Ministry to Wat Pa Luangta Maha Bua to probe the alleged disappearance of three tigers from the temple yesterday. The three tigers are among seven Bengal tigers which the department, under former director general Plodprasob Suraswadee, seized from the temple in 2001 but left them under care of the temple after it promised to look after them. The three missing tigers are 3-7 years of age. The authorities also took with them microchip scanners to identify if there are any other missing tigers. However officials could not conduct the probe after temple staff refused to open the temple and unlock tiger cages. The authorities said they would seek a search warrant from the court and return to the temple again today. They plan to confiscate all tigers from the temple and transfer them to a sanctuary in Ratchaburi province if they find that the temple is unable to take care of the tigers. Concerned authorities have already impounded more than 100 hornbills from the temple, which are suspected to be part of illegal trading.